Since 2010, the Land Art Generator Initiative (LAGI) has sponsored site-specific design competitions, soliciting ideas for public art that generates clean power. Its 2016 contest was the most ambitious yet. 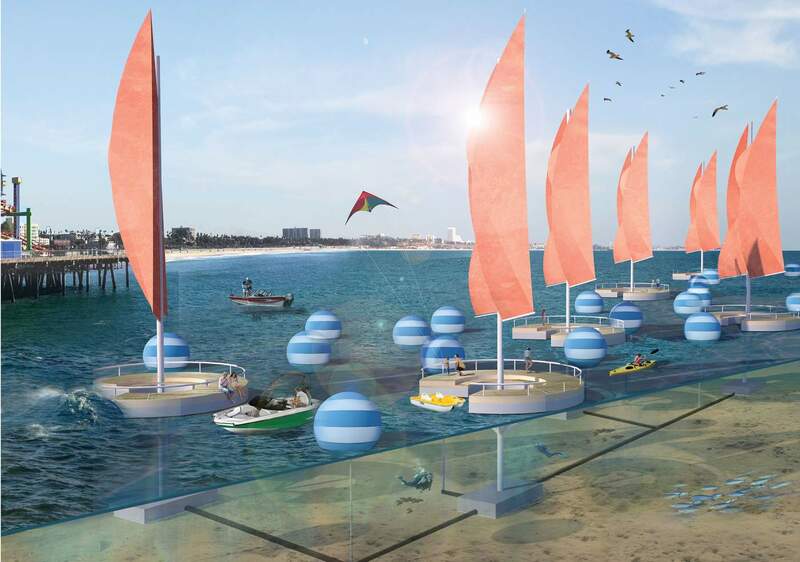 It called on designers to conceive of art installations that generate both clean power and water for the city of Santa Monica, California. Here we present highlights from the competition. Learn more about the contest and the entries here and in Powering Places: Land Art Generator Initiative, Santa Monica. Power plants, once unseen and forgotten, will become an integral part of our daily lives. Embracing this fact, the time is now to proactively address the influence of these new machines on the built environment, and imagine a future in which clean energy technologies have been intentionally designed into well-planned cities. Fog harvesting: Veins on the sails’ surface collect and transport moisture. Annual capacity: 112 million liters of drinking water. Wind energy: Each mast supports eight oscillating belts fitted with magnets to generate electricity. Annual capacity: 70MWh to illuminate the sails. 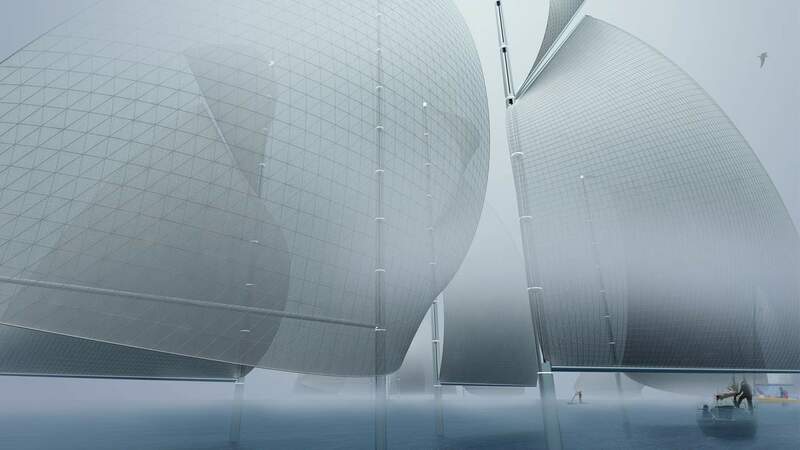 Regatta H2O repurposes the familiar maritime forms of sails and masts as infrastructure—harvesting fog to create fresh water and harnessing the wind to power its operations. The sails of Regatta H2O are fog-harvesting meshes. Collection troughs, designed as veins within the sail surface, transport harvested moisture to the mast, where it can be piped to storage vessels at the Santa Monica Pier. When the moisture content of the air falls below a certain threshold, the sails are retracted to reveal the horizon line of the Pacific Ocean. Even though water is harvested passively, some electrical power is needed to operate the pumping and steering mechanisms and the deployment of the sails. This energy is extracted from the wind via a WindBelt™, a device which relies on an oscillating belt suspended between two electromagnets. Each mast contains eight such devices. At night, light rings pulsate with the intensity of power being generated. This also serves as a navigational safety device, alerting boats of the sails’ presence in the dark. Reverse osmosis water treatment: Power generated on site runs a High Efficiency Reverse Osmosis system to make water from the Santa Monica Urban Runoff Recycling Facility potable. Annual capacity: 650 million liters of drinking water. 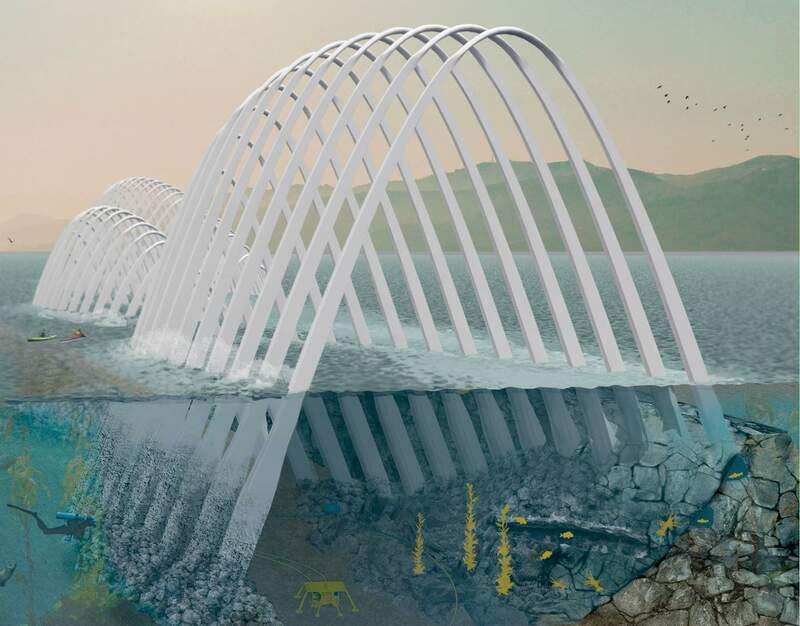 Wind, wave, and solar energy come from wave buoys within the arches’ framework, belts that oscillate with the wind in the sides of the arches, and photovoltaic panels on top of each arch. Annual capacity: 4,300 MWh, 80 percent of which powers water treatment. Cetacea generates power by harvesting the renewable resources of Santa Monica Bay—wind, wave, and sun. Driven by the principle of “clean power for clean water,” Cetacea reconciles water scarcity with pressing social and ecological concerns by supporting the existing water-filtration facilities near the pier. At the same time, it provides carbon-neutral power to city residents. By connecting to the Santa Monica Urban Runoff Recycling Facility and providing enough electricity to run a High Efficiency Reverse Osmosis system, Cetacea contributes to Santa Monica’s 2020 sustainability goals of water and energy independence. Cetacea reimagines the blue whale’s strategy of capturing micro sources of energy on a large scale. In place of sprawling renewable energy farms, a vertical configuration of wave-, wind-, and solar-powered generators within multifaceted arches maximizes energy production within a minimal footprint. Modular arch components mean that Cetacea can easily be expanded in the future through the construction of additional forms. Wave buoys 300 mm in diameter are situated within the framework of the arches, floating at sea level to capture wave energy around the clock. The vertical movement of each passing wave induces the flow of electricity by moving a magnet through an electromagnetic coil. Windbelts™are stacked within the sides of each arch at one-meter intervals. Following Bernoulli’s principle, the form of the arches increases wind speed as it passes through the belts. The resulting aero-static flutter of the belts creates energy by oscillating magnets through an electromagnetic field. Photovoltaic panels positioned at the top of each arch provide solar output. Solar distillation: In the interior of the sphere, evaporation and condensation turn seawater into fresh water. Annual capacity: 2.2 million liters of drinking water. 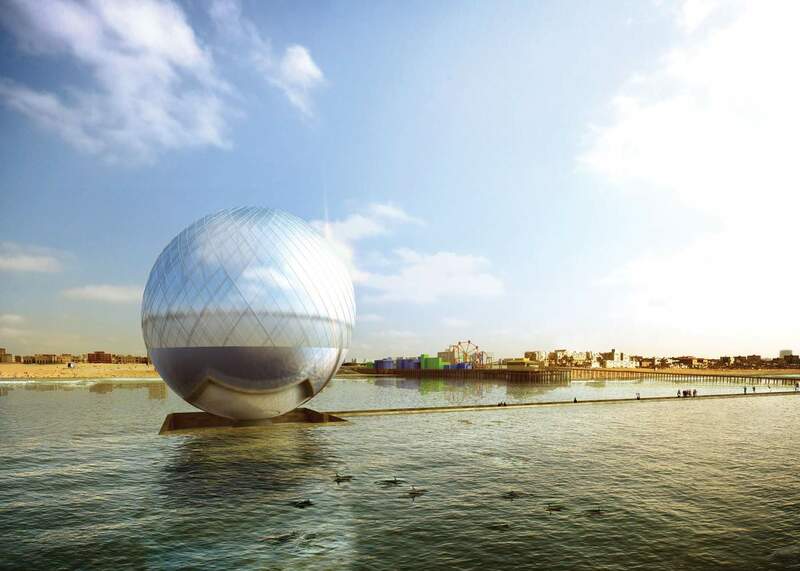 Solar and wave energy: Transparent and luminescent solar concentrators cover the surface of the 40-meter-diameter glass sphere. The outer walls of the 300-meter-long walkway double as a wave-power generator. Annual capacity: 3,820 MWh for the solar distillation pumps and the city’s electrical grid. Walking on the Santa Monica beach, The Clear Orb appears to float upon the surface of the ocean water. The installation is accessible from the Santa Monica Pier via the beach boardwalk. The Clear Orb is a glass sphere approximately 40 meters in diameter. Its surface consists of transparent, luminescent solar concentrators; these solar cells supply power to circulate water into the orb. The orb’s inner space is a solar still that produces fresh water from sea water through evaporation and condensation. 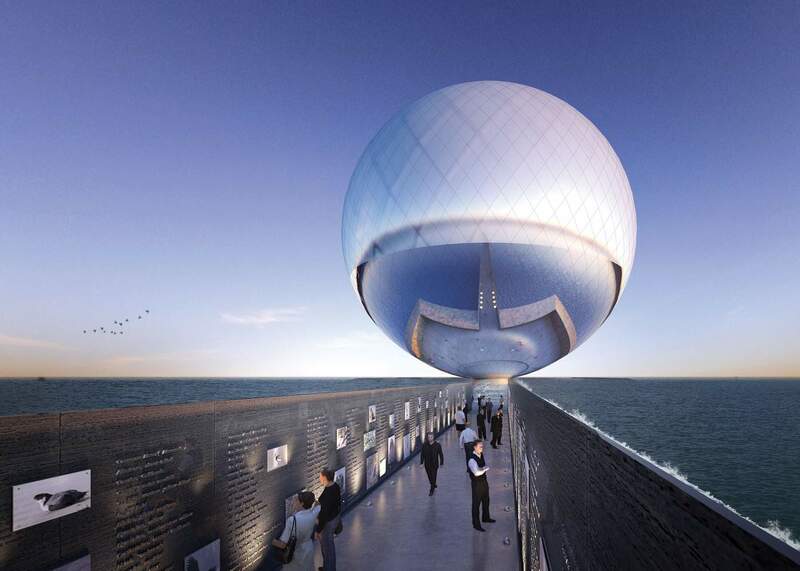 The sea-facing walls of the 300-meter pathway leading to the orb are themselves a wave-power generator that provides additional energy to the solar distillation pumps and the electrical grid of the city. The inside walls along the pathway are filled with a list of extinct animals, offering an opportunity to contemplate how humans might better co-exist with nature. 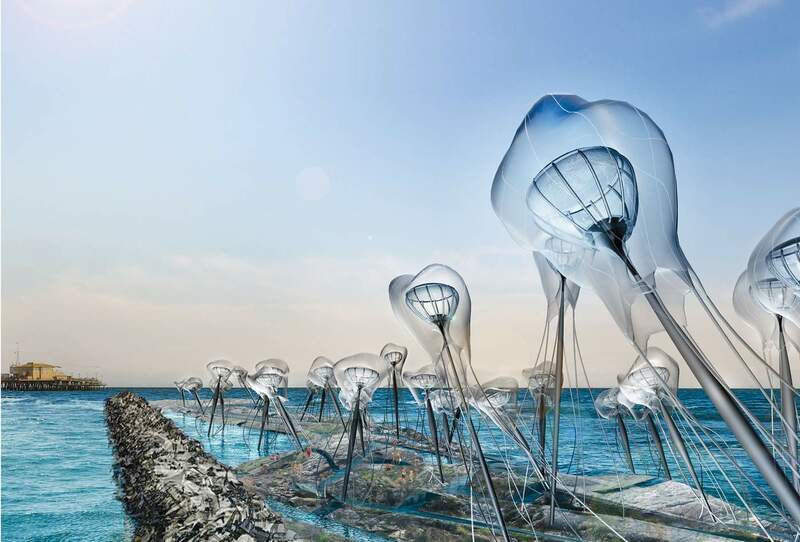 Solar distillation: Pipes bring filtered seawater into the interior of each “jellyfish,” which contains a boiler at the focal point of a Fresnel lens. The lenses track with the position of the sun to maximize evaporation, and the membrane expands water vapor to maximize condensation. Annual capacity: 200 million liters of drinking water. Tidal energy: The breakwater channels currents through turbines to generate electricity. The power is used to pump water into the solar still and to keep distillation going throughout the night. Expressing the mystery and beauty of ocean life, Cnidaria Halitus harnesses the natural forces of the sun and the tides to produce 600,000 liters of potable water each day for the City of Santa Monica. 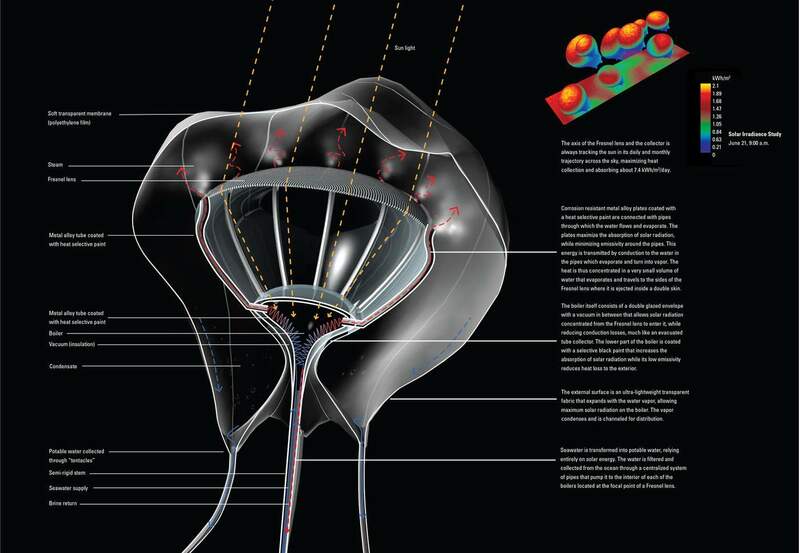 Cnidaria Halitus begins its water-generation process by collecting and filtering ocean water through a centralized system of pipes. Each pipe takes water to the interior of a boiler located at the focal point of a Fresnel lens. To maximize heat collection, the axes of the Fresnel lenses and the collector pipes consistently track the sun in its daily and monthly trajectory across the sky. The sun’s heat is concentrated onto the boilers, which evaporate the seawater. The vapor then condenses inside the external membrane, an ultra-lightweight transparent fabric that expands with the water vapor, further increasing its surface collection area. The expansion and contraction of the external membrane gives the artwork a lifelike appearance. The breakwater is used to channel currents and concentrate them in slits, where turbines generate electricity. This electricity is used to pump the water up to the boilers and to continue the evaporation process during the night. Wave energy from buoys tethered to pistons on the ocean floor: the pistons send pressurized water through pipes to turn turbines. Annual capacity: 16,000 MWh for the Santa Monica grid—and to illuminate sails with LEDs that get brighter as wave intensity increases. Catching the Wave invokes the history of Santa Monica Pier and its breakwater. The area behind the breakwater was once home to a yacht harbor filled with hundreds of sailboats and moorings. The installation consists of 60 “energy buoys,” each eight meters in diameter, that capture wave energy. Their large size increases the efficiency of capturing the energy in each wave. Each buoy is connected by a flexible tether to a piston mounted on the ocean floor. With the upward swell of each wave, the buoy and the piston rise, allowing room for sea water to flood a large chamber. When the wave falls, the buoy and piston fall with it, pressurizing the water into pipes laid out on the ocean floor. Above the surface, the fleet of 15 sailing vessels is clustered amidst the sea of buoys. 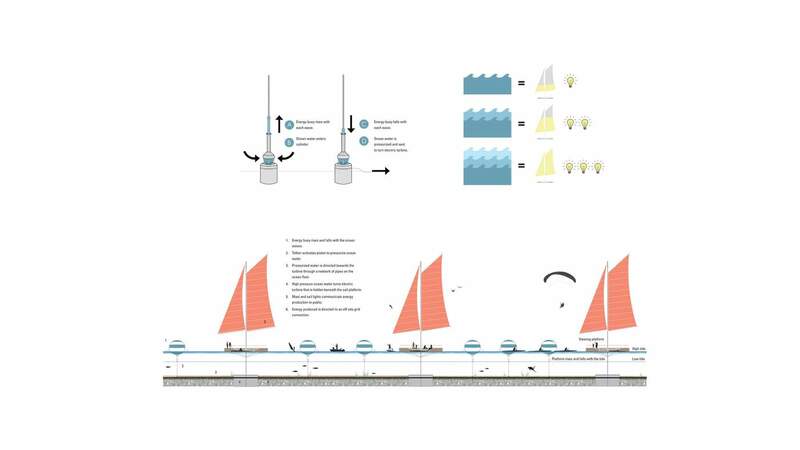 Each 40-meter-tall sail is connected with two to seven buoys which all send their pressurized sea water to the mechanical housing below the sail platform. The pressurized sea water turns a turbine within the housing to create sustainable energy for the Santa Monica grid. As the waves increase in intensity, the sails above become brighter, illuminated by responsive LEDs, so that visitors can see clean energy production in real time. The Land Art Generator Initiative (LAGI), is one of the world’s most followed sustainable design organizations. LAGI is showing how innovation through interdisciplinary collaboration, culture, and the expanding role of technology in creativity can shape the aesthetic and socioeconomic impact of renewable energy infrastructures. 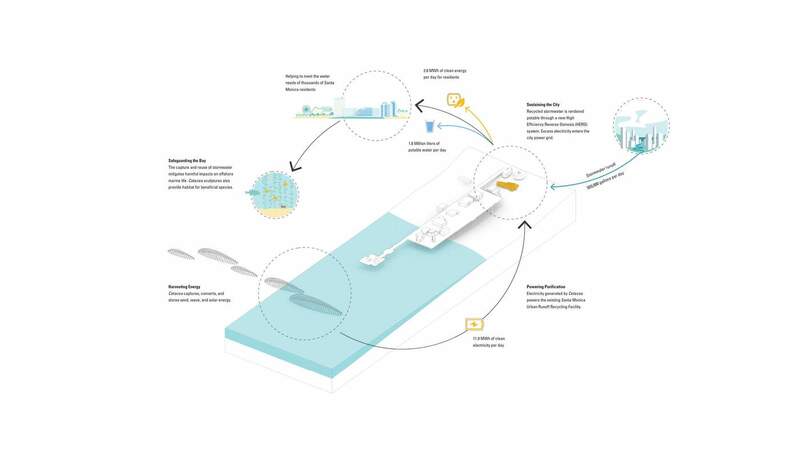 The goal of LAGI is to accelerate the transition to post-carbon economies by providing models of power generation that add value to public space. Open design competitions for Dubai/Abu Dhabi, New York City, Copenhagen, and Santa Monica have brought in over 800 designs from 60+ countries. Participatory design projects include: developing a solar tapestry in collaboration with the homeless community; developing culturally relevant energy solutions with Maasai women in Olorgesailie Kenya; and working with urban youth to design and build a solar sculpture that powers their local community center. LAGI is working closely with cities such as Glasgow and Detroit to integrate renewable energy infrastructure into mixed-use developments. Examples of partnerships and supporters: Masdar, City of New York, NYC Department of Parks and Recreation, City of Copenhagen, European Union Commission on Climate Action, J.M. Kaplan Fund, National Endowment for the Arts, Capital Region of Denmark, the City of Glasgow, and many more. Project descriptions above are adapted from LAGI 2016 contest entries.